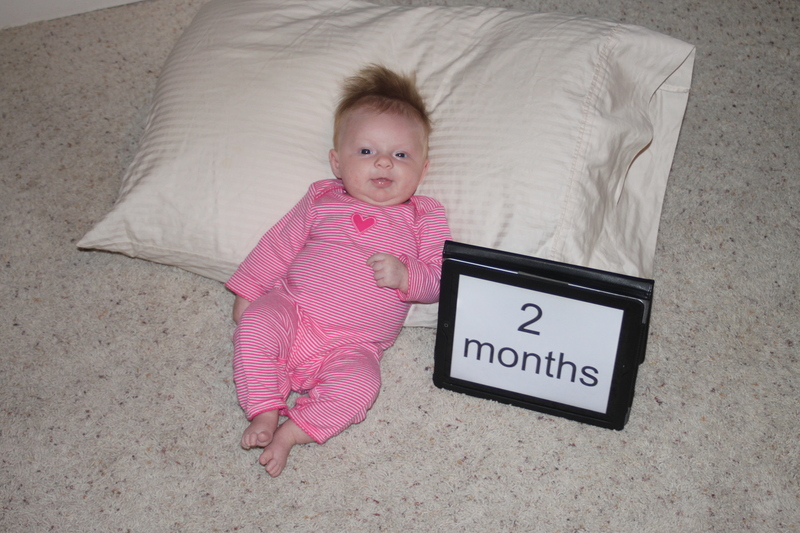 Landri is 2 months old today! 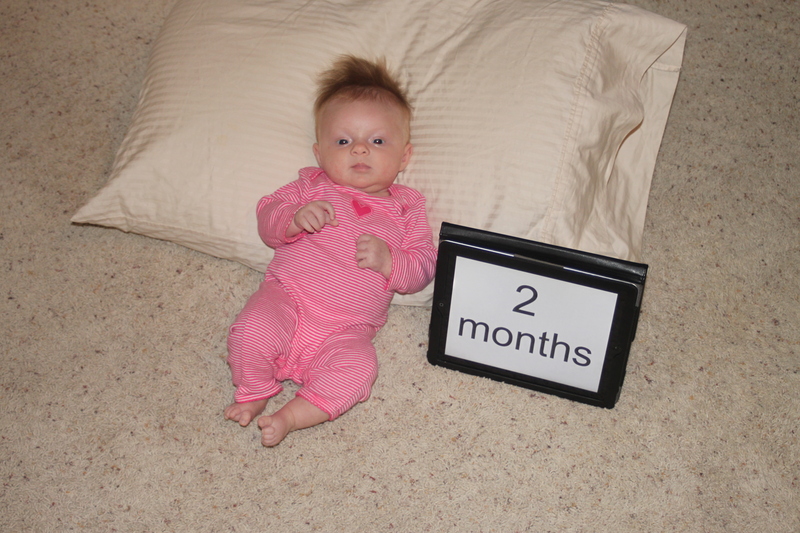 Holy baby how on earth have two months passed by us so quickly? It is disturbing! Landri is growing into such a sweet little girl and we are so very blessed. Lots has happened in the past few weeks and I will try to hit some of the big highlights here and catch you up on All-Things-Landri! On October 25, Landri attended her first wedding at only 6 weeks old! Of course I was terrified of a meltdown during the ceremony and was prepared to shove a paci in her mouth and run away with the speed of a Peregrine Falcon (FYI – that is the fastest bird on earth and can fly at speeds of up to and sometimes over 200 mph). However, I completely lucked out and the little princess was on pretty good behavior. I cannot complain because during the vows, she only let out a few grunts and audibly tooted – but DIDN’T cry! Phew!!! Only a couple people right next to us noticed and they just chuckled. Thankfully, tooting babies are just cute and make people smile. She did wonderful though, throughout the ceremony, the dinner afterwards, and the car ride to and from Austin. Congratulations to Liana and Mark! Thank you for allowing us to share in this special time with you guys! So we have put some serious mileage on our awesome BOB stroller that Scott’s parents gave us. In fact, last night I calculated that Landri and I have already put more than 100 miles on it! 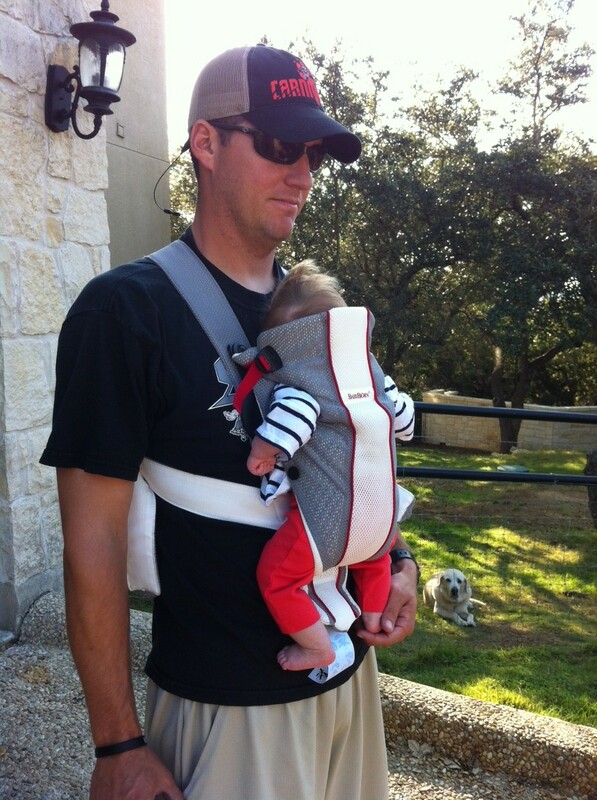 As I mentioned last post, I have started running and am now up to 5 miles for my “long run” this week and will increase that as we near the 2013 3M Austin Half in mid-Jan. Landri continues to do a great job as my passenger and usually just passes out. Luckily we still have not had any dog issues (knock on wood) although I am completely paranoid and silently freak out constantly about being attacked again. I think I have an actual paranoia now! The only real adventure we’ve had so far on a run was getting a flat tire. Who knew this was even possible?! And of course I was a mile into the run when I realized we had a flat and of course at that exact moment Landri decided it would be a perfect time for a complete meltdown. It was fantastic timing though because my neighbor Chad was in town and was able to rescue us with his ATV. And then he even fixed our tire for us! We owe him! And then last week, we decided to add the gym to our exercise routine so Landri had her first ever daycare experience! O.M.G. It was SO hard to leave her. For an hour. With me ten feet away. Not quite sure yet how I will manage all-day daycare 45 minutes away from my office! Hopefully the gym can be a baby step towards that – start slowly, right? This past Friday there was actually a football game that wasn’t a bazillion miles away from the house so I finally got to take Landri to one of Daddy’s games! You may have seen some pictures of her on FaceBook dressed as a football (so cute!). We had a great time at the game with our neighbor Chrissy and her two kids – Carter (3 ½ years) and Camille (almost 6 months). The car ride there was a bit scary though and we worried about what we had gotten ourselves into (see video below and turn up your volume), but once we got to the game, our little circus was very well behaved! Other places Landri has gotten to go to in the last month are: Schertz to vote, Scott’s family’s ranch in Devine for her second cousin’s birthday and to see her great grandparents, and an overnight trip to Austin for our friend Laura’s Baby Shower. She is a great little traveler and just goes with the flow! I’m sure you’re just dying to know this too as it’s probably the most popular question that new moms seem to get… yes, she still sleeps through the night ever since she turned 4 weeks. I know this won’t last forever and she’s slept half of today so maybe tonight will be the night she breaks her awesome streak, especially since I’m bragging on her. But either way, we are very fortunate with her sleep pattern thus far. I haven’t had to take a single nap while on maternity leave! BREAKING NEWS!!! I am pretty sure that in the last few minutes Landri just discovered that she has a tongue! She sticks it in and out and in and out… rolls it up… sticks it in and out… flicks it around… Who knew a tongue could provide a tiny human such entertainment!? I am also pretty sure that she just noticed the TV for the first time, locking her gaze steadily on the NFL game! Or maybe she is just her father’s daughter. Speaking of her father. Scott babysat Landri for an hour while I went for a walk with Chrissy. Wait, as my neighbor Chad points out, “it’s no longer babysitting when it’s your own kid.” Anyhow, Landri was in the Bjorn so she would not interrupt Scott’s beer consumption (just kidding). See the pics. 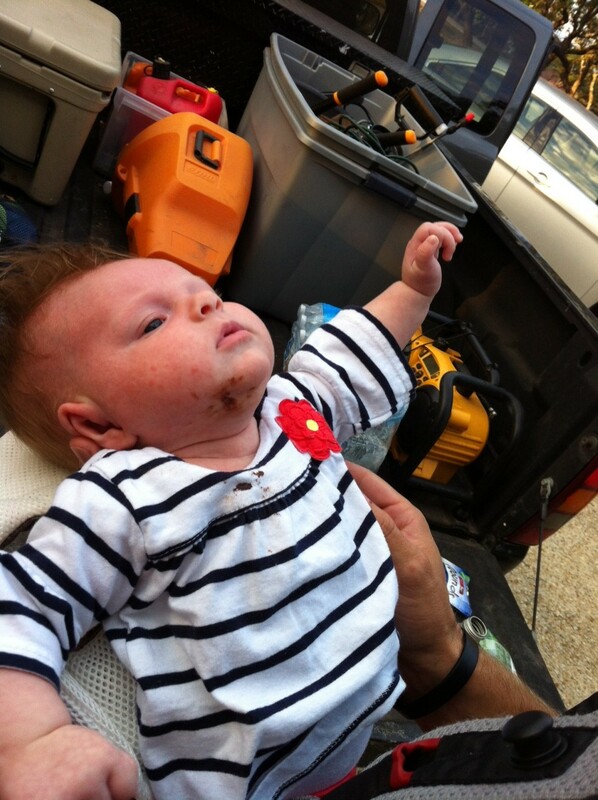 How she ended up covered in chocolate is beyond me! Can’t wait to see what the future holds and what happens after an hour with her Dad when she can actually walk and eat real food! I tried to “interview” Scott a little bit about what he thinks about his daughter and her growth over the last month. He said that he can’t believe that she is starting to show her little personality already, has begun smiling, and is starting to track things with her eyes. He says that her hobbies are “looking cute, taking naps, eating, listening to country music with Daddy, and baby planking” (he helps to pose her – and I will work on getting some photos of that for next time!). Scott also emphatically states that Landri’s dislikes remain the same: wet diapers and an empty bottle; but added a new one: when our dog Smoke licks her face. And he still believes her “crazy” hair to be her most interesting feature. When asked about her skills, you may recall that last month he confidently stated, “What skills?” Well, not anymore! As you saw in my previous post’s video, Scott is impressed by Landri’s head swiveling abilities, as well as her ability to take her pacifier out of her mouth and fling it an extreme distance (never on purpose though). He also says that she “has the grip of 15 babies.” When asked what he loves about Landri, Scott says, “Everything. Except when she throws a fit. I hate that.” Lastly, he also wanted to mention that Landri makes a really funny gasping shriek when confronted with either wind and/or cold air. If winter ever shows up around here, this girl could be in for a shock! So this post as been very Landri-centered as it should be… but with her arrival, Mommy has some new noteworthy skills too! These include increased diaper changing speed, cat-like reflex abilities to catch pee on the fly, and the ability to do anything one-handed, whether it be preparing dinner, folding laundry, or pouring wine (a necessity of course)! Only one not-so-pleasant thing has happened to me since having Landri. Apparently I have a seriously bad case of tendonitis in my left thumb/hand from overuse (holding her, picking her up, etc). The pain is incredible and quite debilitating as it’s starting to interfere with my ability to handle her. My neighbor said she had it too and that the hand specialist she went to said that about half of first time moms get it. I am trying to hold off from seeing a doctor about it but may have to and get cortisone injections if it gets any worse. 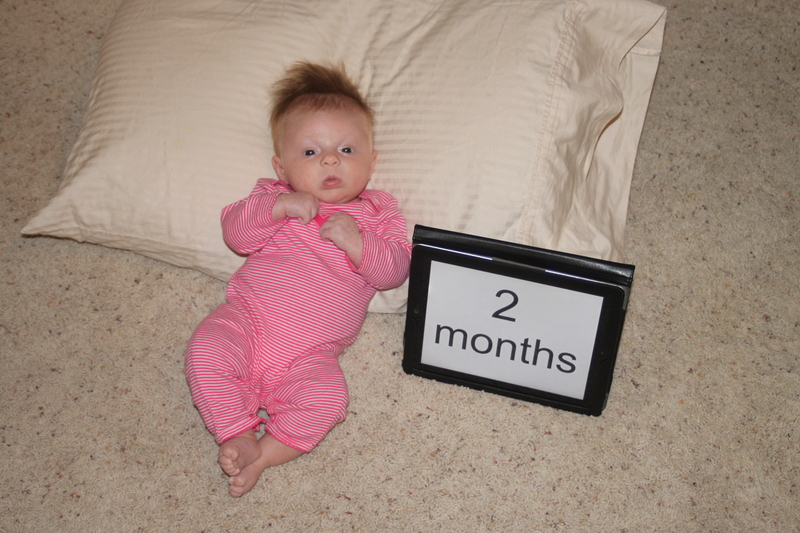 Below are some official two month photos of Landri next to the iPad again.